*Purchase this course down and download it instantly! Hard hitters is a live lecture experience where nothing is held back. You will learn a selection of Daniels strongest effects for close up and stage. Everything in the course is very achievable and hard hitting. From playing cards to mentalism, there is something for everyone on this project. 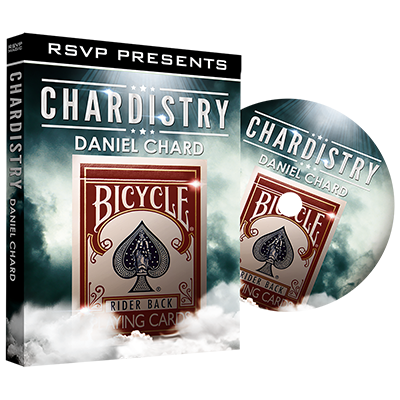 Chard under box 2.0 - You’ll learn the new handling of Daniel’s card under box routine. Each phase taught in depth and new moves. In The Frame: A hit from Daniels stage show. The spectator thinks of a film, you show the incorrect prediction and visually change it to the correct one . Extremely visual, can play to very large crowds and instantly resets. Dreamweaver- visually cause all of the pips to fall from the deck. Leaving every card blank except the signed selection. Magic against humanity: A commercial do as I do effect. Involving matching jokes and punch lines. This can be on stage or up close. Kickback bonanza: A visual sandwich routine with a killer kickback finish. Various handlings discussed. Goals- A mentalist piece that can be done on stage or close up. You divine a goal each spectator is thinking of. Lots of opportunity to put your cold reading to good use. iPhone 11 - A novel and visual pin reveal. Chard double peak control and slip cut variants. Fantastic academy lecture by Daniel. Excellent teaching of some very commercial magic that will certainly find a place in any worker's repertoire. Something for everyone in this lecture so if you want to learn some more technically demanding routines or want to learn some strong but simple effects, this will provide that for you. This is my first academy I have bought and I will certainly be returning for another. Card under box is worth the price alone. Do yourself a favour and get this. Just got round to watching this lecture, was blown away by the level of magic! I’m gutted I didn’t watch it live, literally cannot wait to start learning this stuff and start working it into my working repertoire as I know it’s going to get real world results!! Missed this live, but watched the first set today. Absolute killers. On holiday next week. Will be working on this. Magic against humanity is a brilliant opener and ice breaker to relax you and the audience. Thank you Daniel. Daniel's always been a very clear and generous teacher, and this is a step up for me. The help of the outside input from Alakazam is invaluable. It makes one killer routine seem doable, and I think a good % of the tricks can be absorbed into any magicians act. Want another! This is really good stuff. I have seen these 'card under box' routines before... but the tips Daniel shares help make it seem achievable. Each 'Hard Hitting' effect from the start this evening is a worker for me. Daniel is an engaging performer and teacher. His style is charismatic and enables us to learn with ease. His palming related to me and added to my developing skill. His work on card under box was genius. Great commercial effects, well taught with great tips and handlings of sleights. Some of the sleights will take practice... But that is no bad thing. What a nice, thoughtful guy as well. Good job all round.